The efficiency of heat transfer from a heating fluid in radiators, air handling units and heat exchangers is influenced significantly by the condition of the heat exchange surfaces. Anything that reduces the contact between the heating fluid and the inner surface of the heat exchanger will inevitably reduce the rate of heat transfer. However, even in the cleanest, scale-free wet heating system there will be microscopic crevices and imperfections on the internal heat exchange surfaces. 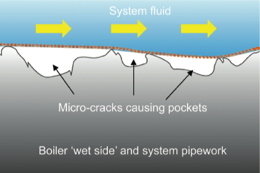 These effectively create gaps between the heating fluid and the heat exchange surface – gaps that the heating fluid is normally unable to enter because of its natural water surface tension. 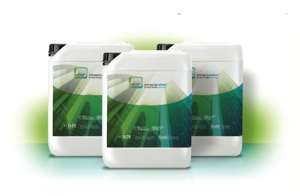 EndoTherm, is an organic based inert system additive that is fully compatible with existing heating inhibitors and heating system water treatment. Typical dosage to the system would be 1% of the total system volume, and will not require further dosing for 5 years under normal system conditions. Independent ‘in field’ verification on over 50 projects has demonstrated energy savings of between 10% and 25% and paybacks typically within two years. These projects involved many different building types, ranging from schools and leisure centres to offices and care homes. As a result of the improved heat transfer, set-point temperatures within the heated spaces can be achieved more quickly so that plant usage and fuel consumption are reduced. 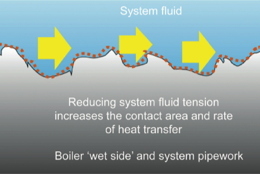 In addition, the increased heat transfer can result in lower return water temperatures (delta T) to the plant room to support improved condensing by condensing boilers. Low return water temperatures may also help to improve the efficiency of low carbon heat sources such as heat pumps and CHP. Delivering further efficiencies from fully modulating boilers.